When we moved into our current house a year and half ago, my daughter transitioned from her nursery to a big girl room. There was already some cute decorations that made the cut but we still had a lot of empty wall space to fill. The back of the crib became a headboard after a coat of turquoise spray paint. Supplies: For the mirrors, I used two thrift store mirrors (that used to be in the master bedroom), skewers, and gold spray paint. Assembly: I hot glued the skewers onto the back of the mirror and attached a piece of scrap cardboard (I think it was the back of a catalog hence the picture) little nails and added a picture hanger. The wall gallery came from a 99¢ calender that I had purchased previously. The pictures were hung with ribbon from wooden letters that came from the nursery. I threaded the ribbon through a bead at each hole to secure it. Later on I secured the calendar pictures with push pins to keep them from flapping around when the fan was on. I love it when a plan comes together. My daughter’s room was all set up within two weeks after moving in. Her cute window treatments were Walmart white panels that I sewed hot pink cotton fabric to the bottom to make them the right length. What is there not to love about free wall decor? Have you DIYed a project to save money? This post was linked to Living Well, Spending Less’ Thrifty Thursday! I love a frugal makeover. Very cute room and I love the mirror idea. Pretty and decorative does not have to be expensive. This is my kind of decorating. I’m always thinking outside the box to repurpose something to make it fit with our new style! Nice! I love the challenge of trying to create “upscale” decor with things I already have. 😉 Thanks for stopping by Stephanie!! The wall art is the focal point of the room it’s the first thing my eyes are drawn to when I come in a room. My mom use to take old stuff and make them new and people would be in awe. Sounds like your momma was quite a lady!! I love having a gallery wall to be the focal point. In fact, except for my son’s room and the kitchen, all of our rooms have gallery walls. I love the idea of repurposing furniture! Love the pops of color too! Thanks Adie!! 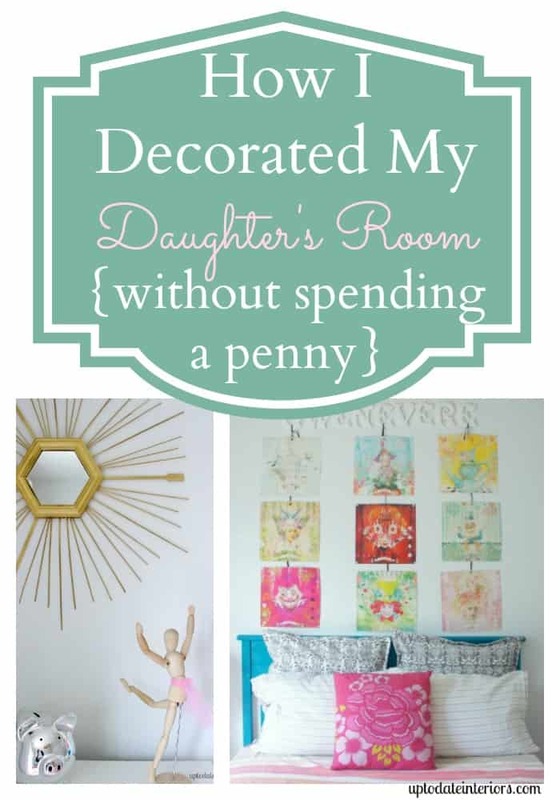 There is definitely lots of pops of color in that room and I LOVE repurposing things (and it’s cheap, lol). Very smart and crafty. I have to begin brainstorming for my daughter who will be 10 next month, or as she likes to say . . . double digits, lol. Oh, I remember turning double digits!! LOL Fun stuff, glad you liked the post! I love it. You are so creative. What happened to the little girl with the pony tail? I always loved that! Thanks Jerrie! So glad you stopped by. 😉 The decal in the nursery stayed… I kinda miss it. I guess I could always get another one! These are fantastic ideas, Kathy, and I’m making note of them because, umm, we hardly have ANYTHING on the walls in our home right now. And while I desperately want to invest in art, that’s not gonna happen for a while unless I suddenly become BFF’s with an incredible artist… and even then, I’d want to pay them for their work, haha. I especially love what y’all did with the mirror. What fun! Thanks Erin!! My husband and I love to going to festivals and farmer’s market to find local art. I usually don’t spend more than $20 on something. I also love Etsy and Cozamia.com to find unique prints. When can you come over and fix my house?! : ( Seriously, you are so creative with this, I envy your eye for design and details. I love the whole room! Smart to use the crib as a headboard too! Oh my gosh!!! Love it! and I love the tree painting,did you make that yourself? adorable. Thanks Melissa! No, I did’t do that painting but it would probably make a great DIY project. It came from Urban Outfitters. Love it!!! Where did you find a calendar for 99 cents?! Hi Danelle! I found the calendar in a clearance bin outside a used book store in Va Beach. It was the previous year so it was already outdated when I bought it. I was just drawn to the Victorian style pictures. I stored it for a few years before I even used it on my daughter’s wall! Gorgeous! I’d love to kniw n where the 2 tone curtains are from! Thanks Jazmine. The curtains started out as white walmart curtains panels and then I added the hot pink fabric on the bottom to make them longer.